If you’ve been alive this week, you are surely aware that Donald Trump’s Presidency is imploding from within while the Big Orange Guy storms around the White House looking for traitors to his one-man cause. With only two months remaining before the midterm elections, it’s difficult to imagine something will happen to turn his fortunes around. Unemployment is about as low as it can go. Republicans in Congress have stopped trying to do any ambitious legislating (if they can keep themselves from forcing another government shutdown, it will be a victory). And while it is theoretically possible Trump could engineer some kind of resounding foreign-policy triumph during the next few weeks, it seems rather unlikely. Which would mean that between now and November, this is about as good as it’s going to get. As pollster Gary Langer pointed out, Trump has the lowest approval rating of any president heading into his first midterm election (the polling data go back to 1954). But what is most striking is the intensity of feeling he produces in his opponents. In the latest Post poll, 53 percent of respondents disapprove of him strongly, while only 7 percent disapproved of him somewhat. If you don’t like Trump, you really don’t like Trump. 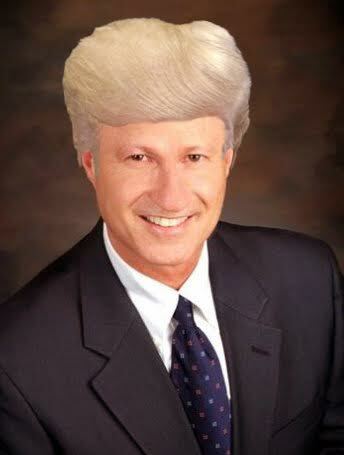 [Coffman] is now under attack by super PACs trying to mislead members of Colorado’s 6th district by casting him as a yes-man for President Trump, but Mike is nothing of the sort. He is an independent-minded leader who has remained committed to American values, his constitutional duties in Congress and serving his district, even when it puts him at odds with the president and his own party. The problem with this statement is FACTS. Democrat Jason Crow is giving Coffman the toughest re-election fight in his 30 years as an elected official, and Coffman’s coziness with Trump is giving Crow and his allies plenty of fodder for television ads; this spot from the League of Conservation Voters is probably the ad that McMullin references in his statement. Voters in CO-6 likely don’t give two shits about what Evan McMullin thinks about Coffman, but the fact that Coffman’s team is trying so hard to promote this tells you everything you need to know about their fears in November. It is important to be fair … Fivethirtyeight.com's table is initially sorted by the "TRUMP PLUS-MINUS" score to get to the image you have on the article. So, he's that high based on the relation to Trump's margin in 2016. 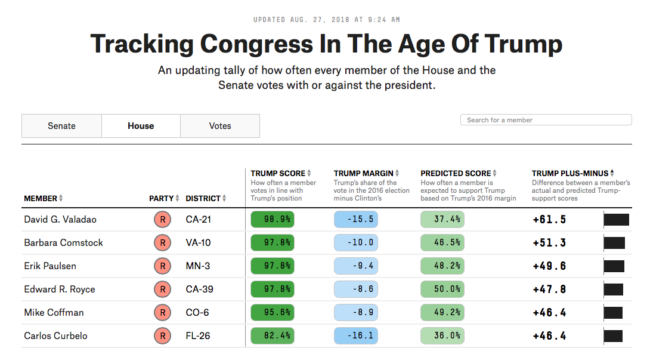 The interested can go to https://projects.fivethirtyeight.com/congress-trump-score/house/, then hit the sort for "Trump Score" to find how often the member votes in line with Trump's position. There are 237 Republicans (193 Democrats, 5 vacancies): Coffman shows up at 95.6% — about 90 down from the 100%ers: Scalise, Chaffetz, and Cloud, but a LONG way above the bottom Republican (Walter B. Jones, NC-3, 49.3%). Yes, it is important to be fair. So if you vote with Trump 95.6% of the time, you don't get to say that you are an independent guy who is willing to buck the establishment. You don't. Yep — 4 whole votes out of all those tracked. And we should not forget that Coffman voted many times before Trump came into office to repeal the Affordable Care Act. Well, it didn't count then. And he only voted against repeal in 2017 after Paul Ryan had his 217 votes locked up and handed out special dispensations to vulnerable Republicans in swing districts. Same with the Big and Beautiful Tax Cut. Republican House members from NY, NJ and CA got the dispensations then.